If you think that meniscus tear treatment can be only possible through surgery, you’ll want to read this. Meniscus tear treatment without surgery is very well possible in most cases. The meniscus tear recovery time without surgery is about two months and the meniscus tear recovery time after surgery is somewhere between 1 and three months. Also, a recent study shows that after one year there is no significant difference between surgery and physical therapy. And today I’ll show you exactly how you can treat your meniscus yourself with a few simple exercises. First, I’ll explain to you what a meniscus is and what it does. Also, I’ll describe what causes a meniscus tear en what you have to do to treat it yourself. So regardless of what your orthopedic surgeon might tell you, you should try to recover your meniscus injury without surgery. Surgery will always be your last resort. Here you will find everything you need to know about meniscus tear treatment. If you find our information helpful and would like to support us, you can donate here through PayPal or leave a review on Google or Facebook. Also, make sure to subscribe to our YouTube channel for more video’s. What are the causes of a meniscus tear? How can I perform a meniscus tear test myself? What is the difference between a torn meniscus and the patellofemoral pain syndrome? What can and can’t I do with a meniscus tear? How do I know if my meniscus tear can recover without surgery? To understand how the meniscus tear treatment without surgery works, you need to know what a meniscus is and what his function in the knee is. The meniscus is a c-shaped cartilage disc in the knee. The knee contains two menisci: the lateral meniscus and the medial meniscus. As you can see in the picture, the shape of these menisci is different. It is because of the unusual form of the top of your tibia or shinbone. Your medial meniscus is more significant than your lateral meniscus. The function of the meniscus is to increase the stability of your knee. Naturally, your tibia and femur don’t fit together. It is because your tibia is flat where your femur is more round shaped. 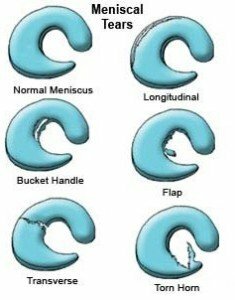 The function of your meniscus is to eliminate these shape differences. The bottom of your femur fits perfectly in the holes that are formed by your menisci. The second function of your menisci is shock absorption. Shock absorption in the knee is significant to protect the underlying cartilage in the knee. Forces affecting your knee during running or climbing stairs are tremendous. Without your menisci your cartilage would be damaged very quickly, leading to a higher risk of Osteoarthritis. We will discuss this later when we cover the different surgery options. Another difference between the medial meniscus and the lateral meniscus is that the medial meniscus is attached to the medial collateral ligament. It holds your medial meniscus firmly into place. That is the reason that a torn medial meniscus is more common than a torn lateral meniscus. Research shows that only the outer 30% of the meniscus contains blood vessels. These blood vessels are necessary for the nutrients of your meniscus in case there is damage that needs repair. The rest of the meniscus gets its nutrients from the synovial fluid. Most of your joints contain this fluid inside the joint capsule. The synovial fluid keeps your joint mobile. Your meniscus gets these nutrients through diffusion. For this diffusion to happen, it is essential that you apply pressure and relaxation on your knee on a regular base.
. How this works is something I will explain to you later on this page. There are three common meniscus tear causes that we’ll explain now. Usually, it happens when playing sports where you have to turn or twist quickly. When you turn, but your foot stays put on the ground, forces on your meniscus get high. Especially when your knee is also bent, you can easily tear your meniscus. Also when you bump your knee, you can damage your meniscus. Slamming your knee almost always happens when your knee is slightly bent. When your knee is bent, your meniscus becomes more prominent in your knee, especially your medial meniscus. You can apply indirect pressure on your meniscus when your knee is bend. So when you bend your knee, it’s easier to damage your meniscus. Another common cause of a meniscus tear is lifting heavy weights. When you lift heavy weights, pressure on your meniscus gets high, up to five times the actual weight your lifting. When your meniscus is already worn out because of your age or a previous tear, this weight can cause new damage. Being overweight may also cause a meniscus tear. Due to the extra weight on your knees, your meniscus gets worn out faster. That may cause a meniscus tear over time. The last common cause of a meniscus tear is when you bend your knee suddenly and immensely. That often happens when you fall on the ground because of a misstep. Because of the extreme bending of your knee, your meniscus gets compressed between your tibia and femur. It can damage your meniscus. The incidence of a medial meniscus tear is higher than of a lateral meniscus tear. That is because the medial meniscus is attached to the medial collateral ligament, where the lateral meniscus can move freely. Because the medial meniscus can’t move freely, it can’t be pushed away by the forces that are applied. Therefore compression increases causing a tear in the end. It is the main reason why a medial meniscus tear happens more often than a lateral meniscus tear. The torn meniscus symptoms depend on the location and the size of the tear. 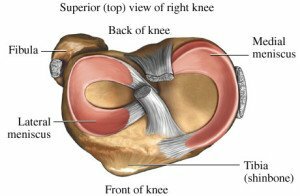 We can divide a torn meniscus into three different types, each with their characteristics. With a minor tear, you have slight pain and swelling. You can walk without much pain and are only slightly limited in your daily life. A small rupture is often caused by bumping your knee. It slightly damages your meniscus on the outside, where recovery is generally excellent. A moderate tear can cause pain at the side or center of your knee. Often swelling of your knee occurs in the first 2-3 days after injury. Heavy lifting often causes this type of injury. Walking is painful but possible. Also bending your knee can be limited, and your knee can feel stiff in the morning or after sitting for a long time. Twisting your knee can also cause a sudden stinging/ sharp pain in your knee. This type of damage usually recovers within 4-6 weeks with exercises. When you experience a severe tear a piece of your meniscus can let loose. Now, this part of the meniscus can move freely inside the joint space. It can cause your knee to pop or lock. When your knee locks, you may not be able to bend it for some time. You can also experience some instability of your knee. That is because your femur and tibia don’t fit together anymore. A bucket Handle tear is one of the most common forms of a severe meniscus tear. Usually, swelling kicks in right after the injury and your knee might become blue after 1-2 days. That is because of a popped blood vessel inside the meniscus or the surrounding tissue. Walking is usually very difficult after a severe meniscus tear. Recovery can take up to 3 months and might require surgery. • Bend your knee into a 90 degrees angle. • Now rotate your lower leg inside and outside. You can also change the meniscus tear test a little bit so it will give more tension on your meniscus. You can do this by also extending your knee after the internal or external rotation. The second meniscus tear test provokes by putting direct pressure on your joint space when your knee is bend in a 90 degrees angle. If your meniscus is damaged, putting immediate pressure will hurt. That is also an indication for a positive meniscus tear test. A torn meniscus is often confused with patellofemoral pain syndrome and vice versa. Fortunately, you can tell the difference quite easily. The pain of a meniscus tear presents at the side of the knee where the pain of the patellofemoral pain syndrome originates on top of the kneecap. Also, suffering from a meniscus tear is felt at one specific place where the pain caused by the patellofemoral pain syndrome is more diffused over the entire knee. Secondly, with a meniscus tear rotation of your lower leg is painful, where with the patellofemoral pain syndrome this doesn’t hurt. You can test this yourself by bending your knee in 90 degrees. Now rotate your foot to the outside. If this aggravates pain in your knee, you can be quite sure you have meniscus problems. Also, the pain of the patellofemoral pain syndrome is challenging to put your finger on and doesn’t have a precise starting moment. Sit on the ground with your leg straight. Now bend your painful knee. Extend your knee again and place your thumb on the inside or medial side of your patella. Push your patella to the outside or lateral side and bend your knee again. If this is less painful, you’ll probably have a patellofemoral pain syndrome. If it doesn’t change anything, you’re more likely to have a meniscus tear. When you suspect to have a meniscus tear, there are several things that you shouldn’t do during your recovery period. The things that you shouldn’t do are activity’s that require extreme bending of the knee or puts a lot of pressure on your knee. That includes squats, lunges or rowing exercises. Also, activities like soccer or running put too much force on your damaged meniscus. Things that you can and should do are swimming and cycling. However, it depends on the severity of the tear if this is possible for you. A general rule of thumb is that the activity itself may cause little pain, but this pain has to disappear within an hour after ending the action. Also, you can perform strength training exercises for your upper leg muscles as long as it doesn’t require putting weight on your knee or bending your knee. We will discuss some activities that will help your meniscus tear treatment without surgery later. If meniscus tear treatment without surgery is possible for you depends on the location and severeness of the meniscus tear. Of the three kinds of meniscus tears we discussed earlier, the minor and moderate damage recover very well without surgery. A severe tear, on the other hand, might require surgery but this doesn’t always have to be the case. In general, the cause of the meniscus tear can be a prediction for the need for surgery. A bump of the knee almost always recovers without surgery within a few weeks. Also, a meniscus tear caused by heavy lifting recovers very well. In general, you can state that the bigger your pain and dysfunction is right after the meniscus tear injury, the more likely you will need surgery. Fortunately, sometimes even a severe meniscus tear can heal with exercises. As mentioned before the inner side of your meniscus is nourished through diffusion of the synovial fluid within your joint capsule. Therefore a tear on the inner side of your meniscus might be harder, but not impossible to heal without surgery. So basically, the only time you need surgery is when you’re in a lot of pain or keep locking your knee badly even after several weeks after the injury. So if you know what caused the tear of the meniscus and if its more on the inside or outside, you can determine the likeliness of recovery without surgery. No matter the cause or the severity of your meniscus tear you should always try to treat it with the following exercise program. Only if this doesn’t reduce your pain within six weeks, you should consider surgery. Remember to start the exercise program slowly and increase the number of repetitions and pressure depending on the amount of pain you’re experiencing. What is a meniscus tear treatment without surgery? You will also feel pain on the side of the knee where the torn meniscus sits. By massaging this spot as well, you will reduce the pain already. By massaging these muscles, your pain will reduce, and it will be more comfortable for you to walk. It will help your recovery and makes it easier to perform the following exercises. because it makes your knee feel warm which makes it also more mobile. 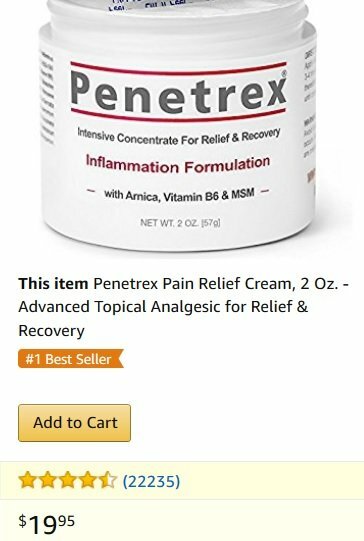 You can also put this anti-inflammatory cream to reduce the pain in your knee. The second important thing you should do is to give your knee rest. Walking, bending your knee and walking stairs all puts a lot of pressure on your torn meniscus. It will prevent it from healing. The best way to give your knee rest is by wearing a knee brace. A knee brace will provide your knee support and solves the instability problem you will be facing in the beginning. Research shows that wearing a knee brace solves various sorts of knee pain including osteoarthrosis and meniscus tear problems. The brace reduces the direct pressure from your upper leg on your meniscus. It results in immediate pain relief. When you feel less pain in your knee, you’ll be more active which will aid your recovery even further. That’s why I recommend wearing a brace for the first few weeks. Since there are a lot of braces available on the internet, I went ahead and selected what I think is best for your meniscus tear problems. shown here to the right. 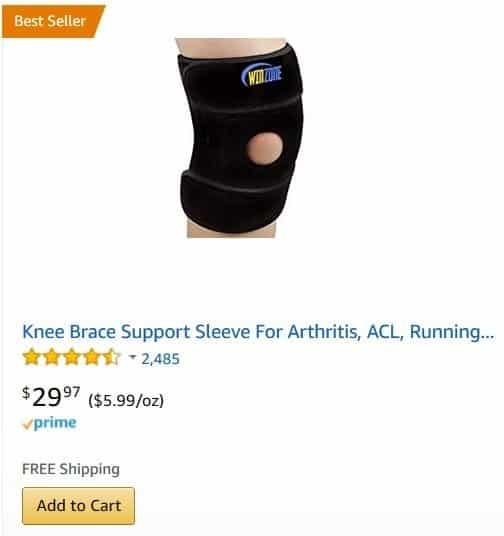 By buying this brace right here, you will also help to support this website to keep the information available for free. The third thing you have to do is to keep moving your knee. 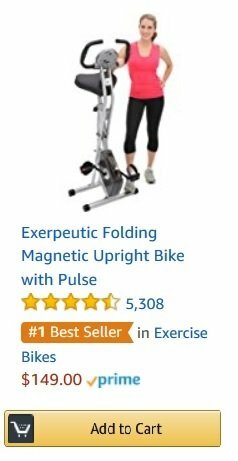 The best way to do this is on an exercise bike. Riding on an exercise bike increase the diffusion of the synovial fluid inside your knee. You need this to facilitate the repair process of your knee. And because you’re sitting, it doesn’t apply pressure on the meniscus, so it still gets its rest. Also, when your meniscus tear recover, you can still experience knee pain in the future because of osteoarthritis. Cycling on your exercise bike will also help against this pain. to solve your meniscus tear without surgery. Together with these to things you have to do exercises. Our meniscus tear treatment without surgery consists of 3 exercises. These exercises will help to increase the strength of your upper leg muscles and increase blood flow to your knee. The meniscus needs nutrition to be able to repair itself. Your blood delivers these nutrients. Research shows that a 12-month training program of the muscles in your upper leg is as effective as surgery for the recovery of a meniscus tear. The purpose of this first meniscus tear exercise is to increase the strength of your quadriceps muscles. This exercise is specially designed to train your quadriceps without putting pressure on your knee or bending your knee. That’s because the demand on your knee will increase the damage of your meniscus. Therefore this is a better exercise than squads. As you perform the exercise, you will notice that it is harder to achieve it with your injured leg than it is with your healthy leg. That is caused by the injury directly. Start with three sets of 10 repetitions and perform this two times a day. Then slowly in time, try to increase the repetitions towards 15 and eventually 20. When you can increase the repetitions, you will notice that your pain decreases. The second meniscus tear exercise is designed to increase the mobility of your knee. When your meniscus repairs, you need to restore the movement of your leg completely to return to full function. With the following exercise, you can increase the mobility of your knee without the risk of re-injuring. When you perform the exercise, you may feel a little discomfort in your knee. However, it shouldn’t hurt too much. Slowly try to increase the flexion over time. The third meniscus tear exercise is designed to increase the stability of your knee. After damaging your meniscus, the stability of your knee is often also decreased. It is because the shape of the meniscus plays a significant role in your knee stability. So to restore this stability, you need to train your knee. What happens is that the muscles around your knee learn to react faster. This way your muscles will compensate for the loss of stability caused by the meniscus tear. Try to perform this exercise as often as possible. You have to stay on your injured leg to train it. You can increase the difficulty of this exercise by doing it on a balance cushion. When you make the exercise more difficult you will retrain the stability of your knee to a higher level. It means that when you walk on an unstable surface or make a sudden movement, this movement has to be much bigger than usual to cause any problems. 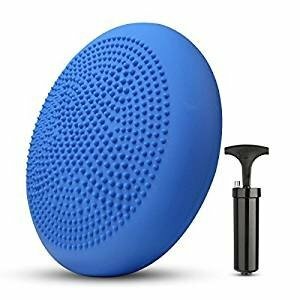 This way the pain in your knee will completely disappear when you can stand on one leg on this balance ball for 20 seconds. A meniscus tear is a prevalent problem. In general meniscus tear treatment without surgery is very well possible. However, sometimes surgery is necessary. Luckily the success rate after surgery is very high. If you have any question after all this information feel free to e-mail me: [email protected], we will try to enter the answers into this post to keep improving it. Don’t forget to share it with your friends so everyone can benefit.